So what’s expected to land on the iPad 2? Well first and foremost, a front facing camera, which would relieve all those dying to do their video chatting on a bigger screen. Most importantly however, the iPad should also be getting a brand new CPU and GPU to help speed things up, the new CPU is expected to be a dual-core Cortex A9-based processor, bringing the iPad up to spec with latest Android devices. Finally as with most Apple refreshes, the next generation iPad is expected to be thinner and lighter as well! 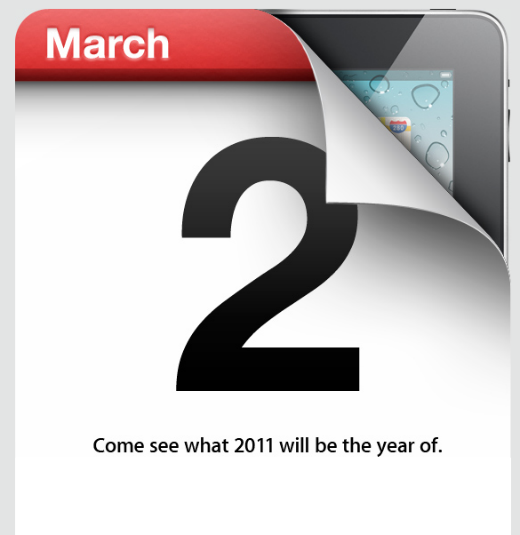 So to summarise, the iPad 2 is expected to be faster, thinner, lighter and sporting a camera. On the other hand initial rumors that the new iPad will also be sporting a high-resolution ‘retina’ display have now been retracted and the latest feeling is that the retina display has not made the final product. In all cases we are pretty excited to see what Apple has in-store for tomorrow and we’ll keep our eyes on the event.